Microsoft Project 2016 and Kanban! in my previous post I wrote about Microsoft Project 2016 and Scrum. Now, I will show you some other things, based on Kanban Agile methodology. This post will be much shorter than previous one, because you can use everything from Scrum. I will show a difference between those two methodologies. Scrum has Product Backlog in which are all Features that have to be done. In serious Sprint the Team is pulling up things to the specific Sprint Board, and those sprint are up to one month long. In Kanban, team has limited Features they are working on at the time. For example Team can (if they decide so) work at one time at maximum five features. That is shortly (VERY shortly) IT! As you can see, each Column can be Renamed, Deleted or Moved. the only one which you can only Rename is Backlog Column! This View has row sorted in strange way (e.g. I do not know how and why are they sorted as they are). Here you can change Board status, e.g. move Features around. Basically, that’s it. Everything else was described in my previous post. What do I miss here? 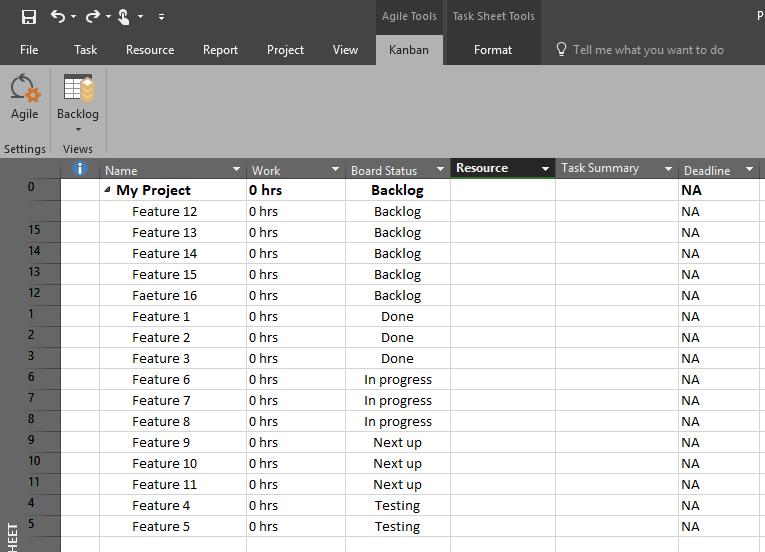 Since Kanban has limited WIP (Work In Progress) I would like to have some place to put that number (for example, 5), and that MS PROJECT doesn’t allow more than 5 Features in that Column. Of course, this column should be fixed by name, or maybe it will be Better that user can choose in which Column he/she will put restriction for number of Features. This entry was posted in MS PROJECT 2016, PMI, PRoject Management and tagged Micorosft Project 2016, Micorosft Project 2016 - kanban, Microsoft Project 2016 - Agile. Bookmark the permalink.